Just thought I'd raise a note about a calculation I made recently for Resto Shaman in pre-raid "BiS" blues. You can find the whole calculation here, but the upshot is that Greater Healing Wave is nowhere near as good as Healing Surge in the current version of MoP Beta. In fact, it's better to the point where I'd suggest you were crazy for not using Healing Surge. I think that this is not intended. 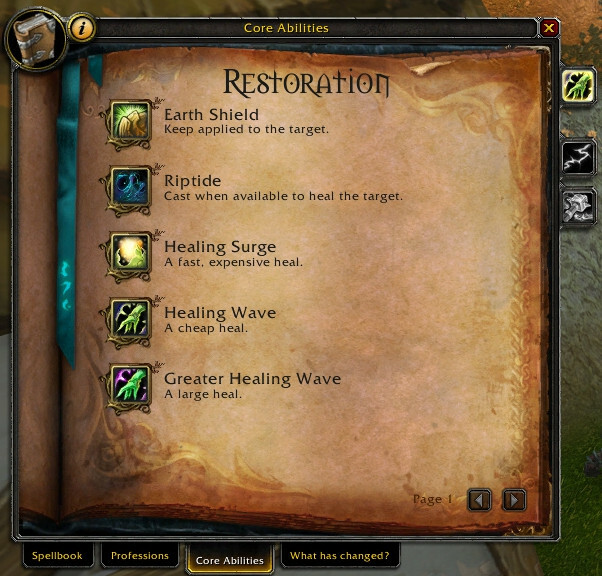 I mean, Healing Surge has always been an emergency heal and I believe that it will remain an emergency heal in MoP. 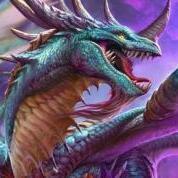 I'd quote the "Core Abilities" page of your spellbook but I cannot log into the beta currently (there's a mega-bug that Blizzard is trying to fix and that prevents a lot of players from accessible their characters). I think, that they just need to buff Greater Healing wave by 10%.. To make it a heal thats more worth than using the Tidal waves + healing surge healing combination. Actually Vixsin talked about that in a comment on the blog post I linked. Apparently, even with the T14 2pc (+10% healing to GHW), HS is still better in every way. Thanks for the info Damien! Just as a note - the costs and healing values changed over last week. The calculations I did are, sadly, no longer valid. I'll be redoing them at some point, but I suspect that GHW will be marginally better in this iteration. Any advice or help would be greatly appreciated. Thanks in advance!! 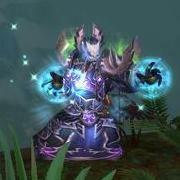 https://worldofwarcraft.com/en-gb/character/chamber-of-aspects/erthol So this is my mistweaver monk here. Now I have actually managed to start raiding and do normals every week. However I have a huuuuge problem, specifically that my hps is really, really low. A good example I think would be this Aggramar fight: https://www.warcraftlogs.com/reports/jKcxbLXrQ9pknDva#fight=27&type=healing You can see how the other monk had much higher hps than me. I do understand my leggos are subpar, but meh, bad luck one could say. What I don't understand is what I'm doing wrong. I try to use renewing mist on cd, use Vivify. I know I haven't used Effuse too much, but that's because I was trying out fistweawing. Anyways, all my other logs are basically the same. I have way too high overhealing as well. Any help would be great, because I'm lost, I love the monk, I love the style, but somehow can't get it to work as I would like it to. Please help meeeeee! Thanks for the feedback. Can somebody explain to me; especially for raids, why my HPS is very low compared to the other healers. All of my items habe atleast Mastery - even 8 Items Mastery & Haste. Nevertheless I'm unable to compete in HPS during raids HC + Mythic. - Lifeboom on tank combined with cenarion ward & rejuvenation. The problem is, even with this I cannot heal more than 400 - 600hps while the other healers are going with 1 mio hps. Maybe someone can explain my mistake.